(Bloomberg) -- The usual selection of handbags, jewelry, clothing, and shoes sits inside the new Hermès store in New York. Bottles of fragrances line one area, while home décor items lie on shelves upstairs. A glass case in the corner contains a white and gray Birkin bag made from Niloticus crocodile, one of the rarest and priciest objects the label creates. Yet the shop itself is quite a departure for the 182-year-old Parisian house of luxury. The 5,330-square-foot location is far from the glitzy confines of Madison and Fifth avenues or the opulent Manhattan malls that have popped up in recent years. 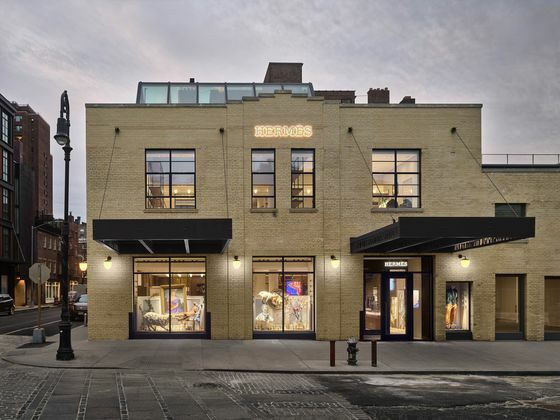 It sits on a street corner between a Theory fashion boutique and a Peruvian restaurant in the Meatpacking District, in an area first made famous for its gritty after-hours nightlife. “We like to be unique and different—a little daring,” Hermès U.S. Chief Executive Officer Robert Chavez says in an interview at the boutique. The company had been looking at the area for several years, studying flows of foot traffic to find the right spot. It’s a block away from the lower entrance to the High Line, the elevated linear park that attracts about 7 million people each year. High-end furniture brand RH opened a massive emporium nearby last fall; Dior opened a store in November. On the opposite end of the High Line, about a 1½-mile walk north, real estate developers have bet $2 billion that the attraction will funnel tourists into a shopping mall that opened just last month with such luxury stores as Neiman Marcus, Fendi, and Cartier. Hermès is betting on that, too. The U.S. market accounts for about 20 percent of its global sales, and growth was especially strong last year, according to Chavez. Global CEO Axel Dumas says there’s still a lot for Hermès to “conquer” in the U.S. The French fashion house first came to New York in 1929 and has expanded throughout the country ever since. Lately it’s been venturing into less traditional locations, where couture sensibilities haven’t penetrated nearly as much as in Paris, London, Tokyo, and other global fashion centers. Hermès now has 34 stores across the U.S., with plans to open as many as 10 more stateside stores over the next five years and to renovate existing ones to add more floors and selling space. Last May it opened an outpost in the moneyed technology hub of Palo Alto. Hermès has recently been dealing with weak demand for formal men’s items such as neckties, rearranging its assortment to offer more casual items like scarves. The retailer experienced stunted growth in revenue from silk and textiles, which rose 3 percent in 2018, the slowest rate of any of the company’s product segments. Hermès plans to start selling a skin-care and cosmetics line in 2020 to expand and help diversify its offerings. At its newest store there’s much to find in the details, since Hermès takes cues from the local neighborhood when designing each location. The surrounding area was once home to hundreds of slaughterhouses and packing operations. These days the Meatpacking District is resolutely gentrified but retains its raw mechanical aesthetic, a zone of empty factories revived as luxury hotels and nightclubs. Scaffolding looms over many side streets as widespread refurbishments continue. Iron and yellow brick adorn the front of the Hermès store, with tall warehouse windows letting in natural light. The staircase has metal detailing throughout. And there are few walls inside, sacrificing the privacy typical of high-end boutiques for an airy, open plan where shoppers can see from one side of the store to the other. Sections weave into each other with few barriers. It has the only in-store cafe in the brand’s U.S. fleet, to bring you a coffee or wine while you shop, with phone chargers and a seating area to relax in. “We’ve created a fluidity here that I think is unique to this store,” Chavez says. Translation: more casual, less stuffy, an experience of luxury without the shackles of it. There are also a few limited-edition items available only at the store—a bicycle, a fanny pack, a backpack, and a skateboard bag, products of the brand’s secretive Sur-mesure workshop. The shop opens its doors to the public on April 5.